In the Georgian town of Akhalkalak, Serozh Hakobyan is one of those rare people who have apartments in two worlds. The one for this life is on Rustaveli St. The one for the next life is in the Akhalkalak cemetery. He tells a visitor: “I am both in this world and in the other one.” And he takes every guest to show them his grave. Serozh says he's ready to go . . .
Next to his family, his grandmother, grandfather, mother and father, he has built his and his wife’s graves, a polished stone with a portrait of the couple and their birth dates, Hakobyan Serozh 1932 and Hakobyan Manushak 1933. All that remains are death dates, a carving task assigned to their only child, their daughter. Making a grave is a man’s job. He has to go find a stone, give it to a master, follow how they’re polishing it, find a painter to carve from photos properly and he has to bargain with everyone. 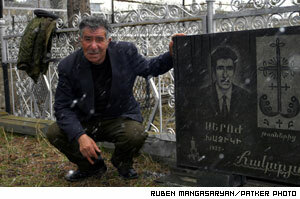 In 1994, when he had some money saved, Serozh did all that’s required for a grave. And, allowed the privilege of choosing how he will be eternally remembered, he carefully chose a painter from Yerevan to do the tombstone portraits. In his town, plenty of others know their final resting places. But the others are next to graves that have already been filled, most with the remains of a spouse, before the survivor’s name was carved next to the deceased. But Serozh’s grave is totally empty, ready for a house warming. “This is my permanent apartment, we are guests here, our main apartment is here, buddy,” says Serozh looking at the black gravestone. The 72-year old former taxi driver isn’t in any hurry to take up residence, but says when that time comes, well, so be it. Serozh says he believes in God and follows all the church ceremonies like Easter, baptism, sacrifice and etc. He always keeps icons in his pocket. Since retiring from the taxi business, Serozh has been a pensioner. He get 15 lari (about $7.50) a month, which of course is not enough for survival. So now he trades at the Akhalkalak market selling sieves and other little things. Doesn’t he get closer to the death by building himself a grave and isn’t he afraid of dying? On Easter and All Saints Day and other church holidays, all the family visits the graves of Serozh’s parents to eat, drink and honor the dead. One day when his grandchildren visit his “eternal apartment”, they’ll see an inscription saying that Serozh’s tombstone is “from grandchildren”.